Winter weather can wreck havoc on our bodies if we’re not prepared. Frostbite and hypothermia are well known dangers but even cold joints can increase risk of injury. Altitude sickness can also ruin a day of play but there are ways to protect yourself. Professional athletes know that warming up before each game minimizes injury and improves performance. But, skiers, by the time we have gotten our clothes on and walked our gear to the lift, often have forgotten to warm up or stretch. Warm flexible joints rebound much better during and after falls, than cold stiff ligaments and tendons. Taking the time to do a couple jumping jacks, touch your toes, stretch your groin and lift your heel to your gluts can be the difference between a torn ACL and a great day of perfect runs. Snowboarders and telemarkers often wear kneepads for protection since they have more contact with the snow and objects that stick out of it. The padding also acts as insulation, keeping joints warm and supported, helping to minimize injury. Kneepads are recommended for skiers too, or at least an extra layer, to keep this important joint warm and lubricated. Clear crisp days with a foot or more of powder are like heaven on earth. However, leaving your skin unprotected can make the end of the day feel like you’ve returned from hell. Sunrays reflect off snow burning skin fast and deep. Apply a 30spf or higher sunscreen at least twice a day. Remember to get the underside of your nose and chin and the area above your goggles. If it is cold, do not wear sunglasses. Wind dries out your eyes and the sun burns your eyelids and eyeballs. Exposed skin, especially cheeks, nose and ears are susceptible to frost bite. Keep an eye on your friends. If white spots appear, it’s time to go in for break. If going in is not an option, cover the exposed skin and try to warm it without rubbing. Keep the area dry. Tuck neck-gaters or scarves into goggles on the bottom, and hats on the top. If you wear a helmet, make sure there is no gap between the helmet and goggles. At the end of the ski day, wash effected area gently with warm, not hot, water and apply gentle moisturizer. Skiing or snowboarding at a resort setting may seem safe, but hypothermia can cause you to loose your mental faculties. Wear wicking fabrics to keep your skin dry so your body stays warm, and wear a hat, as we loose most of our heat through our heads. At the first sign of a deep chill, go in for a snack. Eating will give you time to warm up and give you energy to stay warm and continue skiing. Snowboarders spend more time in contact with the snow. So staying dry is important. If riding in the backcountry, be aware of sweating and of outside water affecting your dryness. Pack an extra dry layer incase you need to change. If you’re travelling far away from civilization or your vehicle, bring fire. If all else fails, build a fire to warm up and dry off. Know when to quit. If you’re shaking, it is past time to think about going in. The body protects its organs first, so in cold, the warm blood circulates more in the core. Wearing dry wicking socks and warm gloves can prevent frost bit toes and fingers. Though many of us wear tight ski boots, if your toes go numb, you are at risk for frostbite. Time for a snack break! Loosening ski boots while on the lift can help, and try not to standing around for long periods. Change your socks and gloves at lunch for a dry pair, and start over prepared for a great afternoon. Nausea, headache and dehydration are all parts of altitude sickness. 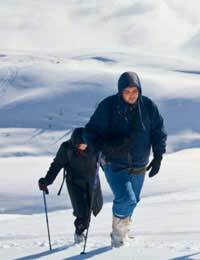 It takes the body two weeks to become fully acclimated, so at higher altitude resorts, stay longer. Spending the first day at a lower altitude if possible, like at a town down the mountain, or at the base rather than jumping on the lift first thing, can help you body adjust. Drink lots of water, take ibuprofen if necessary, and don’t be afraid to take a nap. If symptoms persist or worsen you may need to see a doctor for oxygen. Listen to your body shaking, numbness, severe nausea and burning (cold or hot) are all signs that it is time to go in. And if you’re getting tired, call it a day. Most injuries happen on the skier’s “one last run.” There is always another day, so don’t push yourself to pain. Pamper your body and it will perform in all weather.